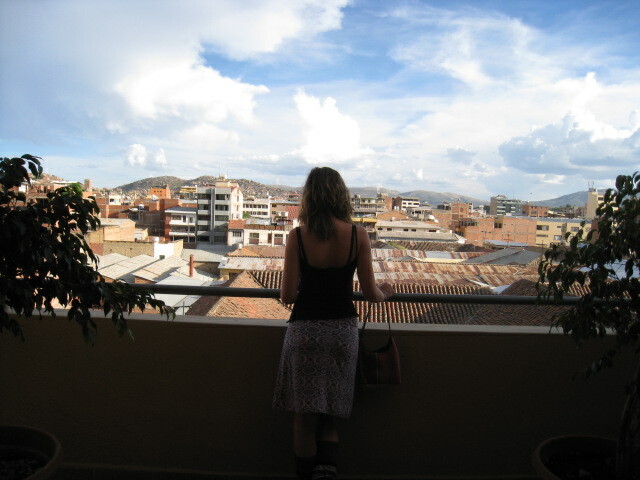 We are holed up in the very Balmy and comfy city of Cochabamba almost smack-dab in the centre of Bolivia. The bus ride here was a bit crazy, but we made it in two pieces and with our luggage. We took an unconventional route here and as most of the more comfortable busses go at night it meant we had to change busses in Orouro at around 3 in the morning. I guess the spaced-out driver of the bus and his swamper/helper didn´t realize we were jumping off in the middle of the night as the bus was due to go through to La Paz. As we noticed that we were leaving town, I decided to knock on the driver´s cab door. The situation in the cab area of this bus was not conventional and the 4 dudes engaged in heated talk (drink?) were not happy about having to talk to me much less alter their trajectories. We ended up (after some harsh words and 3AM sleepy eyed searching in the luggage compartment for our bags) getting dropped off in a rather deserted industrial zone near the outskirts of the city, which in any town, and especially in South America, is not the nicest place to be walking with all your stuff. Luckily cabs are fairly common in most Bolivian cities and one came by quicky enough that we didn´t have to get that weird, scared, menacing spidey-sense feeling you often get when you´re walking though a totally obviously impoverished and dangerous place and totally obviously not belonging there and totally obviously wishing you weren´t there. Anyway, Cochabamba is a bustling little city that sprawls along the floor of a warm and productive little valley surrounded by dryish and rocky mountains. 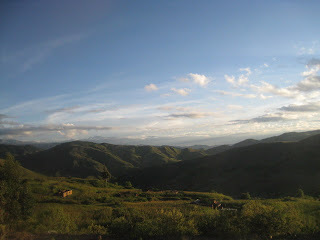 On the next bus in the morning as the sun came up we were treated to some spectacular views! In terms of climate, it feels a little like parts of Mexico here. So far I´ve found Bolivian cities to be very busy with people. To compare, every night in these citys looks like a festival weekend in Vancouver to me. On warm nights the plazas and streets fill with young and old alike. Children kick balls, teens make-out and sometimes there´s a performance or a politician is gladhanding for mayorship, but most people just seem to be out for some socializing and people-watching. We´re treating ourselves to a rather nice room with non-electric hot water nozzles and Cable TV as it´s in a very good location and we were desperado for someplace quick to sleep after the big Red-Eye the night before. 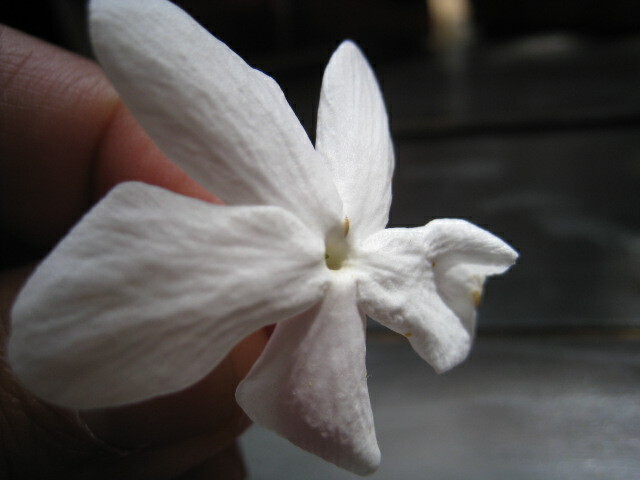 Have I mentioned yet that it´s nice to be someplace tropical and warm? Well, the world flocks to such places for many reasons not the least of which is the scent of Jasmine blossoms and possibly new and exotic foods. Bolivia is all bout the meat when it comes to stuffing your maw. 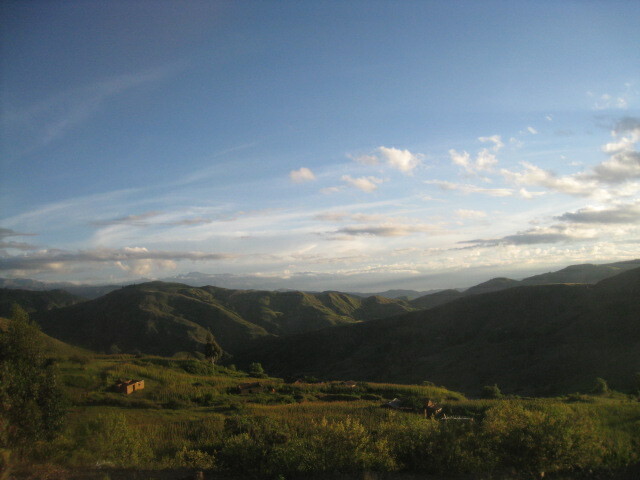 I wolfed down this dish just before jumping on the bus and faught it all the way from Sucre to Cochabamba. 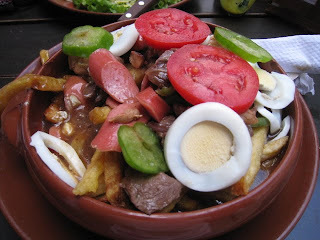 It´s called Pica Lo Macho and it´s basically a version of Poutine but instead of cheese curd on top it´s 3 meats, yes, 3 meats (chicken, beef, sausage), veggies, egg and hot peppers! Yee Haw! Not for the weak - stomached.